I’ve been thinking a lot about my grandmother recently, since having a really wonderful dinner at a Seattle restaurant which focuses on the region her beloved father emigrated from, and made the kind of food she used to make. That’s why, when I had a meh cantaloupe and some sub-par peaches on my hands and was pondering how to perk them up, my thoughts went immediately to the dessert she made most often. I’ve already talked about her other dessert specialty, but that was her winter favorite. 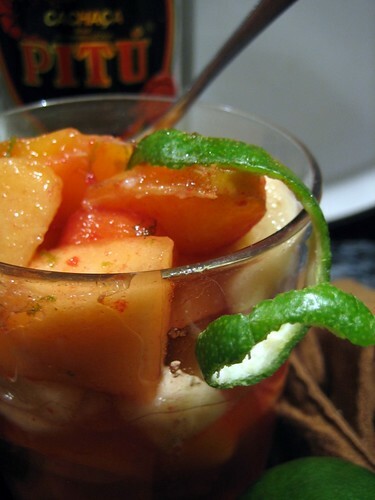 What she made for the weekly barbecues when she visited in summer was mixed-fruit salads moistened and kept from browning with fresh-squeezed orange juice, preferably served in a glass instead of a bowl, and accompanied by whipped cream or ice cream. She also liked to add a slug of alcohol to the grown-ups’ portion, normally brandy. So one thought led to another, and what resulted was very much inspired by her, even though she never made fruit salad this particular way, with a lime macerating syrup and a shot of Cachaça at the end. Grandma regularly vacationed on the beach in Brazil with her friends, though, and caipirinhas, which I love, would have been right up her alley. I even had it in a glass in her honor. To my dismay, Jamie Oliver has had a similar idea, but his is procedurally different and certainly wasn’t inspired by my grandmother, so I’m going to pretend it doesn’t exist. Combine the sugar, water, and vanilla bean in a small saucepan and bring to a boil, making sure all the sugar has dissolved. Remove from the heat, pour out ¾ cup into a liquid measuring cup, and refrigerate the rest for sweetening lattes, lemonade, or iced tea. Zest the limes and add the zest to the measuring cup. Peel the melon, seed it, and dice into cubes. Pit but don’t peel the peaches and plums, and dice them slightly smaller. Combine the diced fruit in a large bowl. 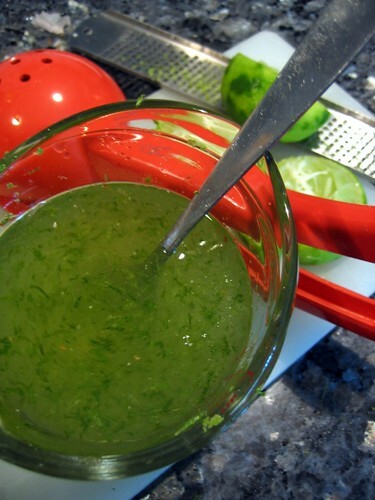 Juice the limes and add the juice to the zested syrup with the pinch of salt, stirring to combine. Pour the syrup over the fruit, mix gently to evenly distribute it, and cover the bowl. Refrigerate the salad for at least half an hour to let the fruit macerate. When ready to serve, peel and slice the bananas and add to the salad, spooning the fruit and a good quantity of the syrup into highball glasses. Pour half a shot of Cachaça into each glass, and top with slightly sweetened whipped cream or vanilla ice cream, if desired. You can use any fruit you like in this. Pineapple, mango and other tropical fruits would obviously work really well, but apples, pears and grapes in the fall would be just as good. The bananas are pretty essential, in my opinion, but they should be added just before serving to prevent them going brown and mushy. If you can’t find Cachaça, you can substitute vodka or white rum according to your preference. I like to have leftover fruit salad for breakfast, and to His Lordship’s disgust, I’ve also been known to sprinkle in corn flakes for texture. (Gauche, I know, but we all have our food shames.) If you want to include this in a brunch, you could be more elegant about it and offer fancy granola and Greek yogurt, or you could put the leftovers in a pitcher with a bottle of wine and call it sangria. Pimento cheese is one of those foods I feel should have been in my life all along, but I’ve only been eating it for about a year, since hearing a paean to it on an NPR show – I can’t recall which, but most likely it was The Splendid Table. I think it was actually His Lordship who made the first batch inspired by that show, but I’m the one who ran with the concept and kept it a regular part of our repertoire. In theory it might sound somewhat gauche and maybe even a bit dodgy (mayonnaise smooshed into cheese?). In practice, though, it’s a brilliant customizable spread that keeps well in your fridge the whole week, and can be schmeared on a bagel as you dash out of the house on Monday morning, form the base for fancy mac and cheese mid-week, and provide a ritzy burger topping at your Saturday barbecue. As long as you use really good ingredients, I say pimento cheese is perfectly respectable and even gourmet, the American cousin of fromage fort. They serve it at snooty golf venues, after all. We originally started with this recipe and made it straight the first time, but every batch since has drifted further away through various modifications. My latest iteration added complexity with smoked gouda and horseradish, and increased the amount of pimentos and mayonnaise just a wee bit to make it even more spreadable. I left out the dill pickles, because I only like them in very specific contexts and this isn’t one of them, and the garlic, which I normally love in almost anything but didn’t want getting in the way of the horseradish. 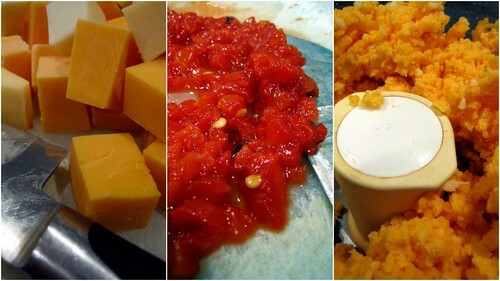 Dice the cheese into approximately one-inch cubes and place in a food processor. Pulse just until the cheese is completely broken up into small pieces but not pureed. Finely dice the pimentos and place in a large bowl with the mayonnaise, horseradish and a few pinches of salt. Using a wooden spoon (because the cheese will laugh in the face of any spatula you try to use on it), mix until a homogeneous spread is achieved. Taste and add more salt and/or horseradish as needed. Keep the pimento cheese in a covered container in the refrigerator, but it will spread best if you leave it out at room temperature for a short time before using. You can vary the cheese (except not Velveeta or anything with “food product” in the name, for the love of all things dairy) and the seasonings as desired. If you want a different kind of heat, for example, leave out the horseradish and use jalapeno or chipotle Jack instead of Monterey. 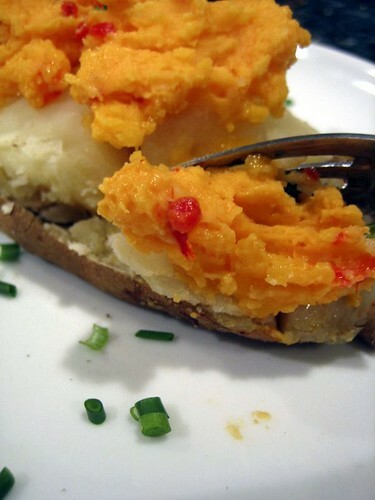 You could do this without a food processor by finely grating all the cheese on a box grater, which will get you a more textural but still spreadable pimento cheese.